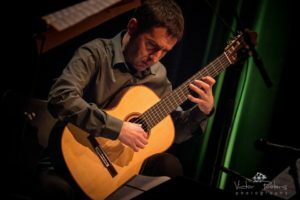 The wide inspiration of his musical language is the result of a subtle use of the forms, an endless and original rhythmical search and a colour work which leads the guitar to explore new territories and sonorities. In his compositions we can find charm and vitality of the Balkan’s music at the same time bright and ‘stormy’, dreamy and rhythmic, tender and tenacious. Ourkouzounov has written over 80 works for guitar—solos, duos, trios, quartets, instrumental ensembles, and two concerti—a number of which have won important prizes, and a majority of which have been published by leading publishers (Doberman-Yppan , Henry Lemoine). Several internationally recognized performers have played his works. Among them Zoran Dukic, Denis Azabagic, Scott Tennant, Shin-ichi Fukuda, Alberto Vingiano, Eduardo Isaac, Pablo Marquez, Antigoni Goni, Duo Gruber-Maklar, Miscelanea Guitar Quartet, Los Angeles Guitar Quartet, Thibault Cauvin, Dimitri Illarionov, Jérémy Jouve , Carlos Perez, Juan Carlos Laguna , Thomas Muller-Pering, Duo Palissandre, Ensemble Nomad, Patrick Kearney, etc. Atanas Ourkouzounov performs widely as soloist and with the Japanese flautist Mie Ogura. In addition to seven CDs on which Ourkouzounov plays, more than 50 CDs of his music performed by others are currently available.